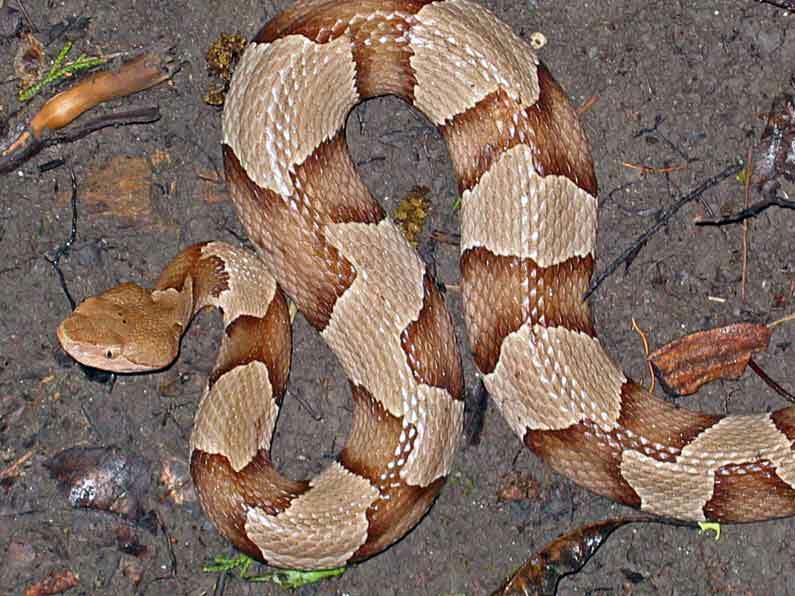 IDENTIFICATION: Copperheads are usually colorful strikingly patterned snakes. The name comes from the copper-like coloring of the head. The background color of the back and sides is tan to pinkish. There are darker, chestnut colored bands across the back and sides. Each band is of varing width, often described as hour-glass shaped. 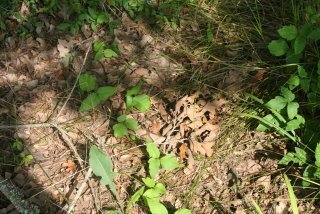 Newborn Copperheads are colored and patterned like adults, except the last inch of the tail which is a bright, sulfur yellow color. HABIT: Lives in wooded areas, among rocks, or near streams or ponds because prey are plentiful in these locations . Favorite hiding places include stone walls, sawdust, mulch or compost piles, and under decaying stumps, in wood piles, under abandoned building debris, and under large flat stones. This snake will be seen basking during the day when weather is cool but not cold. FEEDING HABITS: Feeds on cicadas, caterpillars, mice, birds, frogs , small rodents, insects and lizards. LIFECYCLE: Late summer through mid-October, between 1 and 14 young are born alive rather than hatched from eggs. SNAKE BITE: A Copperhead snake bite needs medical attention, is extremely painful, and may cause extensive scarring and loss of use. Many people are bitten while trying to kill or handle the snake. Don't take chances -- avoid these snakes.